Smoking is far more common among people living with HIV than in the general population. In the United States general population, the prevalence of smoking has declined from 42% in 1965 to 17% in 2014, but a 2015 study estimated that 40% of people living with HIV in the United States still smoke. In the United Kingdom the ASTRA cohort study found that people with HIV were more likely to smoke than the general population (29% vs 19%), and in particular, were far more likely to be heavy smokers. A recently published study estimated that smoking has a greater impact on the life expectancy of people with HIV than HIV infection that is well controlled by treatment, due to cancers, cardiovascular disease and chronic obstructive pulmonary disease. Smoking is a major risk factor for numerous cancers, especially lung cancer. What is less clear is whether, in people living with HIV, the risk of various cancers begins to fall after people stop smoking. Although the risk of lung cancer begins to fall in the general population after people stop smoking, it is not known if the same is true in people with HIV. To answer this question Leah Shepherd of University College London and researchers on the D:A:D cohort study looked at the risk of developing various cancers among former smokers in the cohort. The study looked at cancer incidence in all study participants between 2004 and 2015, and compared outcomes between people who were smokers, never-smokers, people who were ex-smokers at the time they entered the study, and people who gave up smoking during the study period. Ex-smokers were stratified according to whether they had given up less than a year ago, 1-2 years ago, 2-3 years ago, 3-5 years ago, or at least five years ago. Study participants were followed for a median of nine years. A total of 1980 cancers were diagnosed among 35,424 participants (242 lung cancers, 487 other cancers recognised as smoking-related, and 1251 not related to smoking), 46% of whom were smokers and 20% ex-smokers. Lung cancer occurred overwhelmingly in current (70%) or ex-smokers (21%). Other smoking-related cancers such as head and neck, oesophageal, stomach, pancreatic, kidney and urinary, ovarian and liver cancer, also occurred predominantly in smokers (52%) and ex-smokers (21%). Cancers not related to smoking were also more commonly diagnosed in smokers (47%) and ex-smokers (20%). Crude analysis of incidence showed that the risk of smoking-related cancers (excluding lung cancer) fell very substantially more than a year after quitting and thereafter it was comparable to the risk of people who had never smoked. Age, gender and CD4 cell count did not affect cancer risk in any analysis. On the other hand, lung cancer incidence remained at least eight times higher in ex-smokers five years after giving up when compared to people who had never smoked (aRR: 8.26 95%CI: 2.83, 24.09). This finding is in contrast to observations in HIV-negative people, where a decline in the risk of lung cancer begins to become detectable within five years of stopping smoking. The study is limited in its power to explore some of the factors known to influence smoking-related cancer risk, such as smoking intensity and the duration of smoking, because of a lack of data. 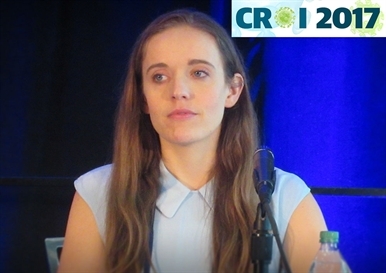 Leah Shepherd said that longer-term follow-up of cancer risk in people with HIV will be needed to provide more information about risk, especially for lung cancer. Smoking emerged as one of the most important risk factors for heart attack in an analysis of 29,515 people with HIV receiving care in North America, presented by Keri Althoff of Johns Hopkins University, Baltimore. The study set out to determine what proportion of heart attacks in the population of people with HIV were attributable to various risk factors. These included, on the one hand, the well-established risk factors: smoking, high cholesterol, treated hypertension, diabetes, body mass index (BMI) of 30 or above and stage 4 chronic kidney disease. The analysis also looked at the contribution of HIV-specific risk factors: CD4 count below 200, lack of viral suppression, an AIDS diagnosis, and HCV infection. The NA-ACCORD cohort study recorded 347 heart attacks among participants during a median follow-up period of 3.5 years. The prevalence of smoking in the cohort was extremely high: 75% in people who did not experience a heart attack, and 84% in those who did. Smokers were 80% more likely to have a heart attack than never-smokers – similar to the risk of heart attack seen in people with stage 4 kidney disease, diabetes or a current CD4 count below 200. But this degree of risk was dwarfed by the risks attached to hypertension. People with high blood pressure, even though it was being treated, were four times more likely to have a heart attack than people without, and people with a BMI of 30 or above and elevated cholesterol were three times more likely to have a heart attack than those without elevated cholesterol. Surprisingly, high cholesterol in the absence of obesity was not associated with an increased risk of heart attack. Considering the contribution of these risk factors to the total number of heart attacks, three stood out. If everyone stopped smoking 38% of all heart attacks would be avoided. If everyone had normal cholesterol, 43% of heart attacks would be avoided, and if everyone had normal blood pressure, 41% of heart attacks would be avoided. In comparison, changing risk factors associated with HIV would have a much smaller effect on the total number of heart attacks. Keri Althoff drew the attention of delegates to previous research from the same cohort study, which found that stopping smoking would make the single greatest contribution to cutting cancer diagnoses in people with HIV. Controlling cholesterol would have greatest impact on end-stage kidney disease and on heart attack. Similarly, modelling of the burden of cardiovascular disease among people with HIV in the Netherlands between 2015 and 2030 found that smoking cessation and cholesterol and hypertension management would result in far greater reductions in cardiovascular events than HIV-related interventions such as earlier diagnosis and treatment or avoiding antiretrovirals with known cardiovascular risks. The model, presented by Rosan van Zoest of Amsterdam Institute for Global Health and Development, used data from the Netherlands ATHENA cohort and the D:A:D study to simulate cardiovascular disease over time. The model predicts that the annual incidence of cardiovascular events will increase by 55% between 2015 and 2030, and that improving the rate of smoking cessation would reduce the number of heart attacks by 6-13% each year. However, the model makes the ambitious assumption that it will be possible to achieve cessation rates of 50% or 100%. In clinical settings, smoking cessation rates are much lower. Althoff K et al. Impact of smoking, hypertension & cholesterol on myocardial infarction in HIV+ adults. Conference on Retroviruses and Opportunistic Infections (CROI 2017), Seattle, abstract 130, 2017. Shepherd L et al. Cessation of cigarette smoking and the impact on cancer incidence in the D:A:D study. Conference on Retroviruses and Opportunistic Infections (CROI 2017), Seattle, abstract 131, 2017. Van Zoest R et al. Cardiovascular prevention policy in HIV: recommendations from a modeling study. Conference on Retroviruses and Opportunistic Infections (CROI 2017), Seattle, abstract 129, 2017.